Text When this card you control is destroyed by battle or card effect and sent to your Graveyard: You can Special Summon 1 "Yang Zing" monster from your Deck, except "Chiwen, Light of the Yang Zing". 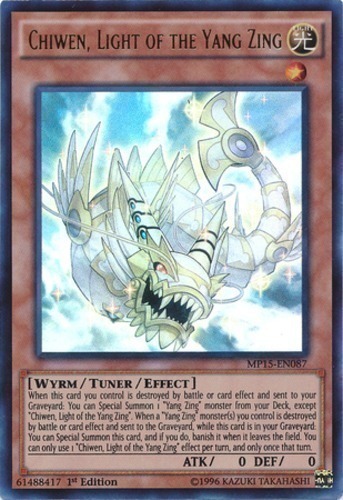 When a "Yang Zing" monster(s) you control is destroyed by battle or card effect and sent to the Graveyard, while this card is in your Graveyard: You can Special Summon this card, and if you do, banish it when it leaves the field. You can only use 1 "Chiwen, Light of the Yang Zing" effect per turn, and only once that turn.